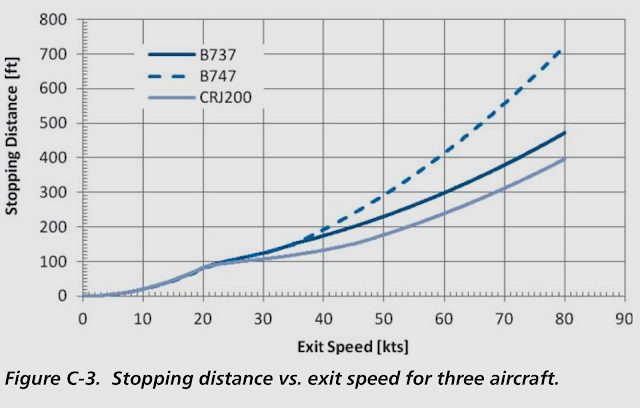 Runway factors change the normal stopping distance of a Boeing 737-700. Standing water can more than double stopping distance. Southwest WN278 overran the KBUR (Bob Hope, Burbank, BUR) runway 08. The Boeing 737-700 rolled into the Engineered Material Arrest System (EMAS) that had been installed as a result of another Southwest 737-300 which overran the same runway in March 2000. This was the second airplane to be fortunate for arrestment by that particular EMAS installation. Lateral approach path shows a correction right-to-left on short final, which may have led to running off the left side of the runway. The last recorded speed of 49 knots at the runway end, after a normal arrival point, and expected touchdown point (assuming appropriate landing weight), leaves standing water/hydroplaning as the most likely overrun villain. There is no data to confirm the reason for lack of deceleration and control; only data to show it did not (which is evident in its final resting position). The nose-gear entered the EMAS probably traveling between 35 and 40 knots. Aviation safety initiatives demand improvements to limit recurrence of the same factors that cause an accident or injury. 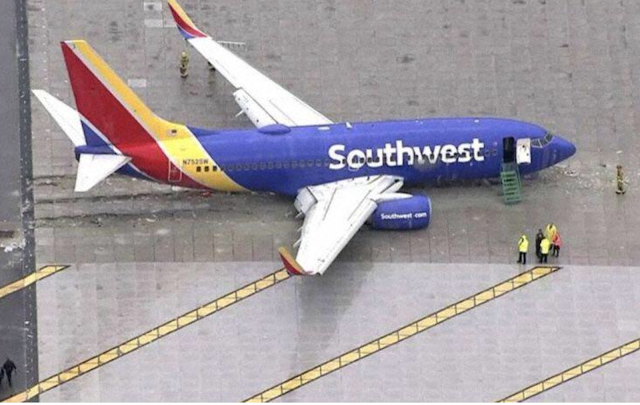 While two Southwest 737s have overrun the same runway, this time EMAS brought the Southwest airliner to a rapid stop without significant injury. 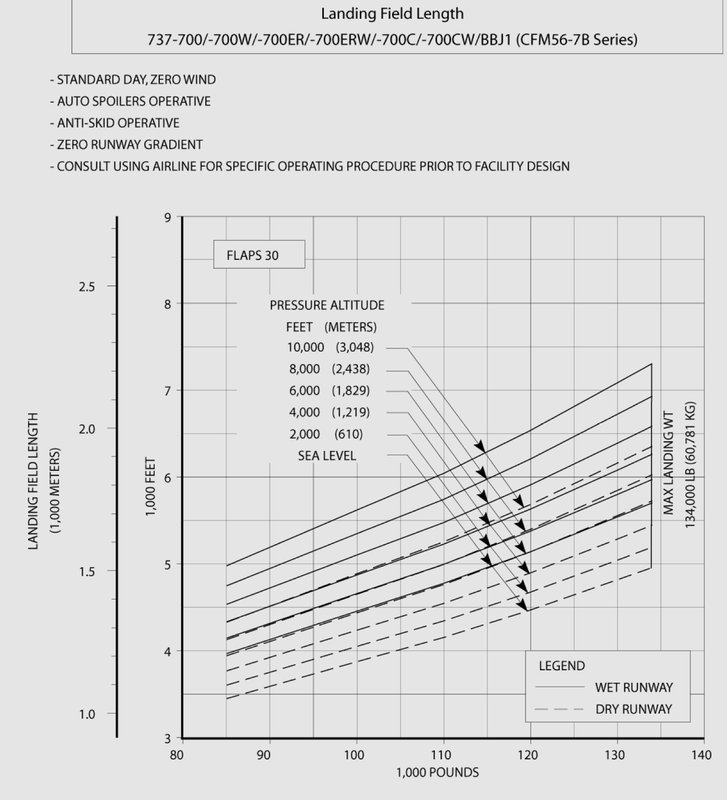 This post makes reference to unofficial copies of training and operational manuals (in italics) thought to be relevant to 737-700, as part of informing the public, without compensation, as fair use. The information and analysis is offered freely for educational purposes. This discussion has no connection to the official investigation into the accident, and to which the official agencies investigation and conclusion are the final authority. The first part of this post covers factors that affect stopping distance. Each factor is discussed, with some scaling factor. 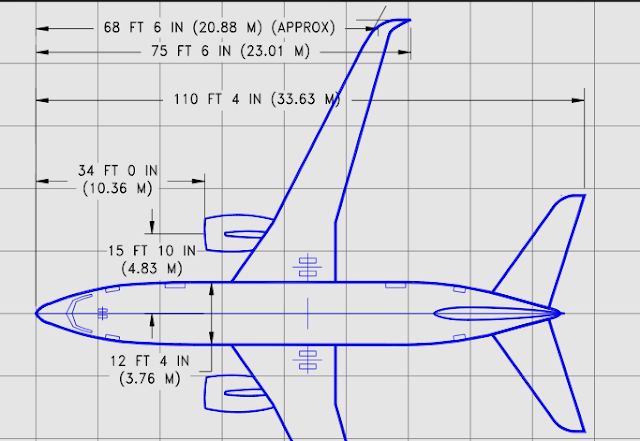 The second part of this post covers the two Southwest 737 overruns at Bob Hope Airport. An appendix at the end digs into EMAS factors. A runway excursion involves an airplane that operates outside of the runway while taking off or while landing. 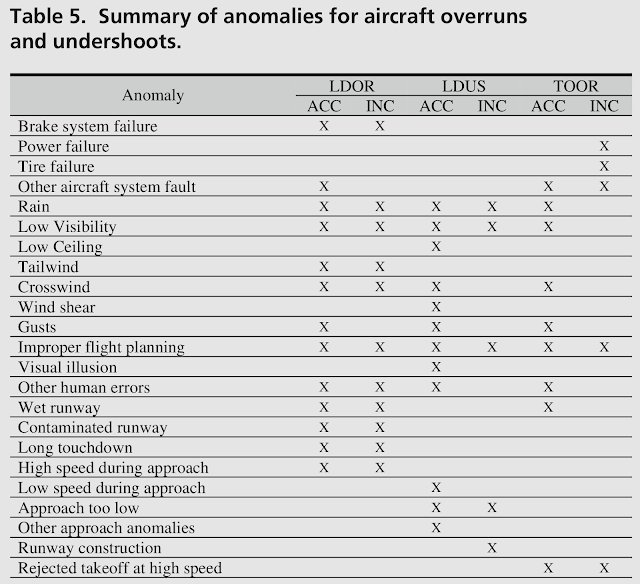 These include Undershoot, Landing off (the runway), Veeroff, Overrun, and Other. Stopping distance is a measure of how much runway it takes to bring a landing airplane to a stop. 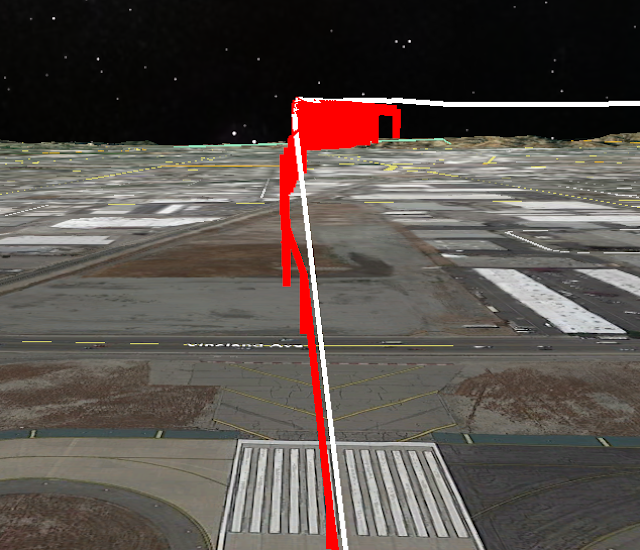 Runway length should always be longer than stopping distance, else the airplane will "overrun". An overrun can be catastrophic, with the airplane breaking up, and bringing great risk to adjacent people and property. Procedures require careful planning to ensure that arriving airplanes will not overrun. A test pilot is trained to operate an airplane with great precision. A landing is the pinnacle of pilot technique, as the progression of actions must be done at the right time, at the right place, with the right airplane state. The test pilot develops a minimum stopping distance that is sort of like a badge of honor. Risk management demands acknowledging a natural variation, where everything has a range of values. In general, this means a margin of safety is applied. 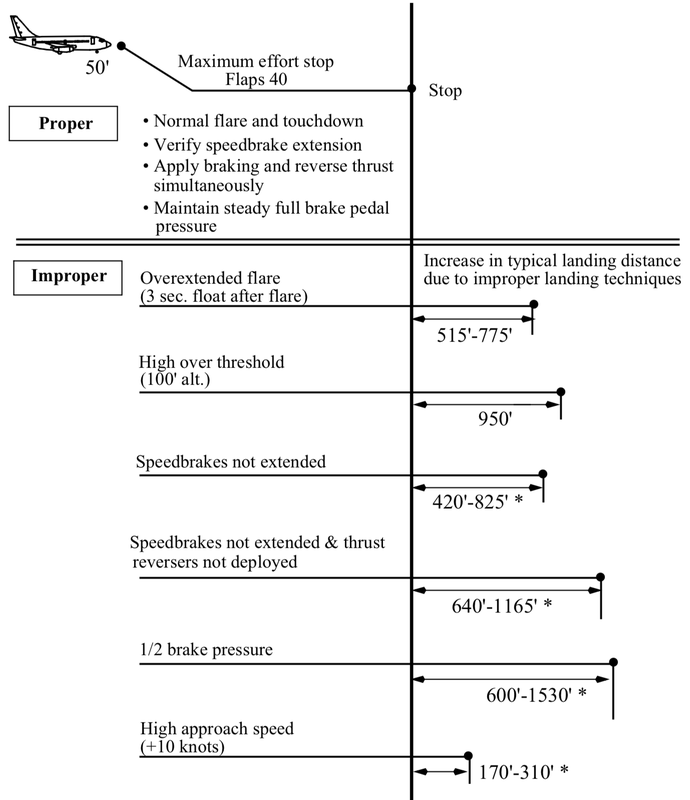 The margin of safety for landing on a dry runway with good surface friction is 67%. If the test pilot needs 6000 feet to stop the airplane, the runway must be 10,000 feet long. If it is wet, add another 15%. Pilots must take into account the landing gross weight of the airplane, the headwind/tailwind component, and the runway surface conditions, when planning an arrival. With this accomplished, unforeseen factors, notably standing water, but also the precision of the landing, lie in wait as the greatest contributors to an overrun. The different aspects (anomalies) can be encountered differently. 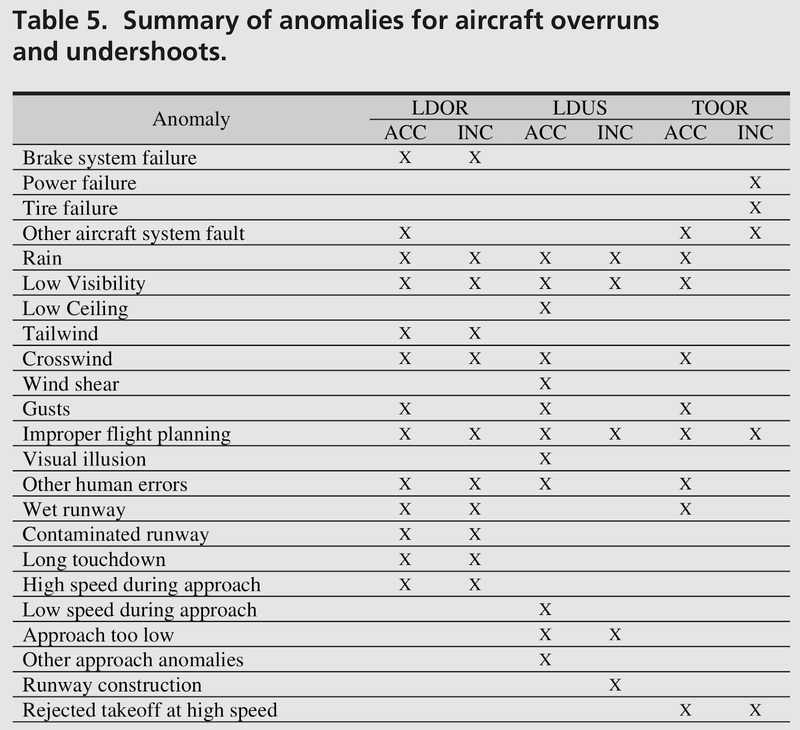 Landing overrun (LDOR), Landing undershoot (LDUS), and Takeoff overrun (TOOR) likely anomalies are shown below. 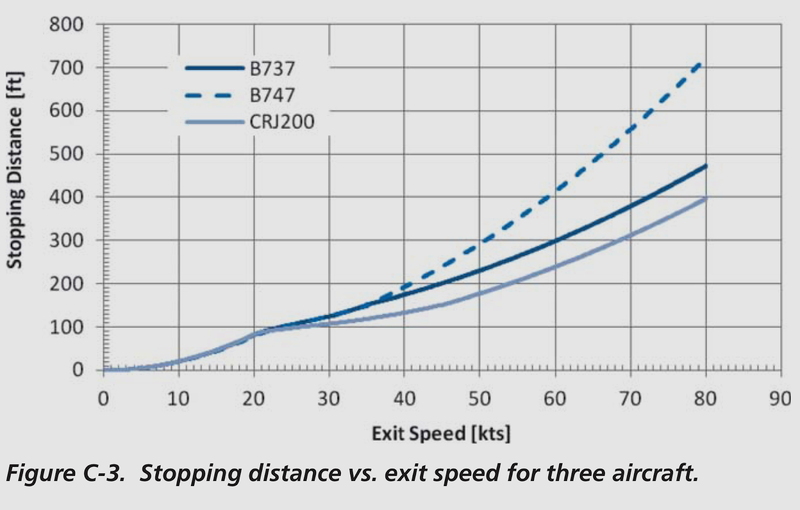 The following chart from a Boeing training manual highlights the change in stopping distance due to a number of factors. The glide path traces the aircraft position as it travels to the runway. 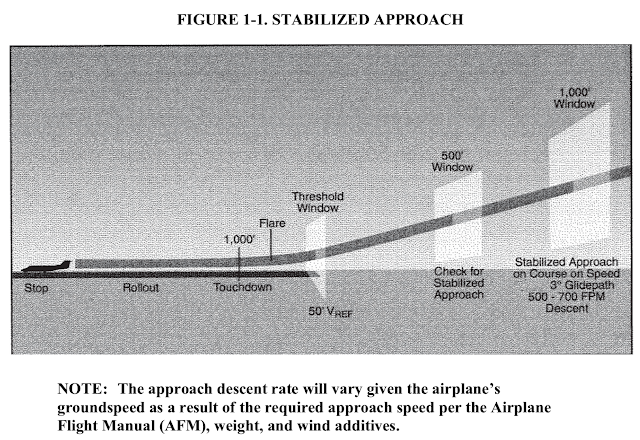 Most approaches are setup for a 3 degree glide path. If the glide angle is smaller, the path is flatter with reference to the approach. A rule of thumb is five times the approach groundspeed in knots is about the vertical descent rate in feet per minute. 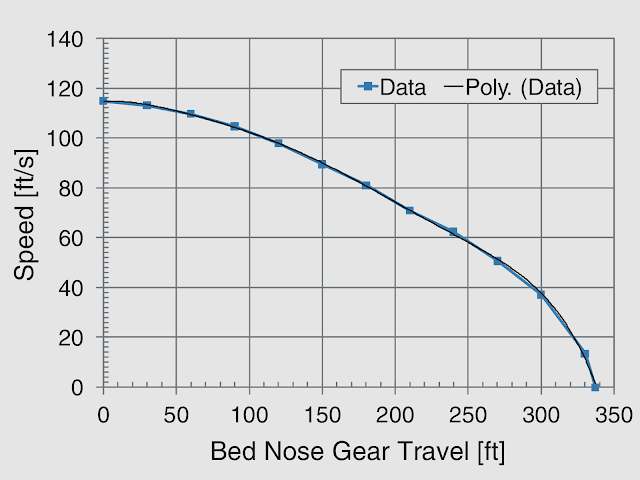 3 degree Glide Slope Descent Rate Vs Groundspeed. Glide path angle also affects total landing distance. As the approach path becomes flatter, even while maintaining proper height over the end of the runway, total landing distance is increased. The aiming point and the approach glide path deliver the airplane to a certain height above the threshold. Arriving just 50 feet above planned can extend the landing distance dramatically. For example, on a 3° glide path, passing over the runway threshold at 100 feet altitude rather than 50 feet could increase the total landing distance by approximately 950 feet. Floating refers to the part of the runway used up before the main gear touchdown. Aerodynamic braking comes from drag. While floating, assuming idle power, the airplane will decelerate, but slowly. While floating, runway alignment becomes critical to ensure proper touchdown positioning, and that can be more difficult in a cross-wind. Floating above the runway before touchdown must be avoided because it uses a large portion of the available runway. Deceleration rate on the runway is approximately three times greater than in the air. Speedbrakes have two modes, in-air and ground. Basically, some of the speedbrakes are used all the time, and the rest of them are only used for landing. Speedbrakes are panels on the upper surface of the wing that spoil the lift when they stick up. Speedbrakes are used to increase aerodynamic drag in flight. Speedbrakes are used to increase the weight on the landing gear, to enhance braking performance. Unless speedbrakes are raised after touchdown, braking effectiveness may be reduced initially as much as 60%, since very little weight is on the wheels and brake application may cause rapid anti-skid modulation. Pilot awareness of the position of the speedbrake lever during the landing phase is important in the prevention of over-run. Once the main gear are on the runway, the pilot lowers the nose to lose lift and add more weight on the landing gear, and to add the nose for steering as soon as possible. 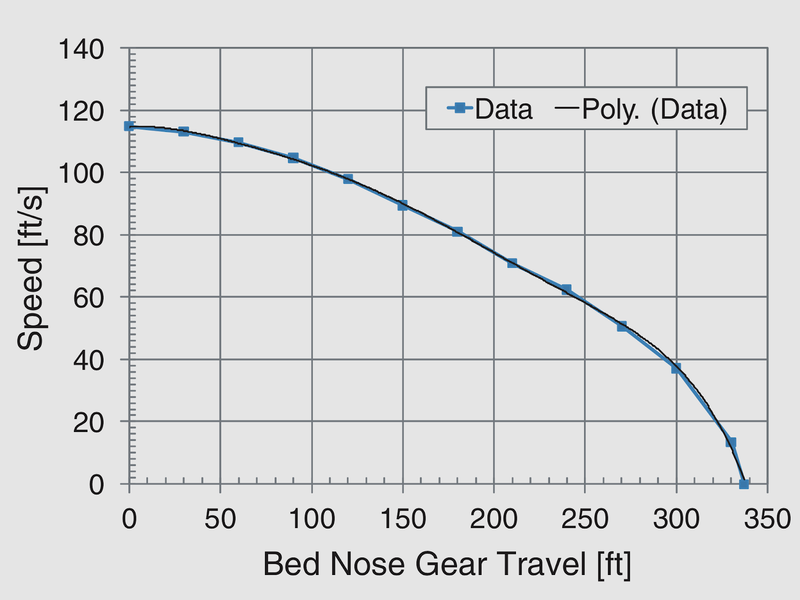 Leaving the airplane with the nose-up does increase aerodynamic drag, but the brakes are far more effective for slowing down, plus control of the airplane is significantly improved. 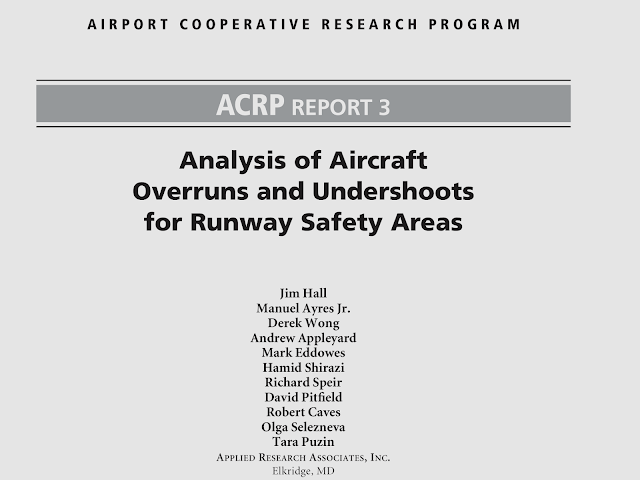 If the nose wheels are not promptly lowered to the runway, braking and steering capabilities are significantly degraded and no drag benefit is gained. Rudder control is effective to approximately 60 knots. Perform the landing roll procedure immediately after touchdown. Any delay markedly increases the stopping distance. Prompt and proper operation of all means of deceleration has a major influence on landing distances. Spoilers greatly decrease lift, dump the weight on the wheels, and thereby make the brakes effective. It should be noted that manual spoilers, operated by the pilot, involve a delay. Even 2 seconds at speeds of 200 ft/second (118 knots (kts)) can increase the stopping distance by almost 400 ft. Landing distance data in the AFM is typically based on a time increment of 1 second between successive actions to manually deploy/engage the deceleration devices. A conservative approach is to add 200 ft to the landing distance for every second in excess of 2 seconds to deploy the airplane’s deceleration devices. Delay in deceleration can be encountered if the landing is too softly such that the landing gear wheels don't spin up quickly. Lufthansa 2904 encountered this back in 1993. DLH 2904 flight from Frankfurt to Warsaw progressed normally until Warsaw Okecie TWR warned the crew that windshear exists on approach to RWY 11, as reported by DLH 5764, that had just landed. According to Flight Manual instructions PF used increased approach speed and with this speed touched down on RWY 11 in Okecie aerodrome. 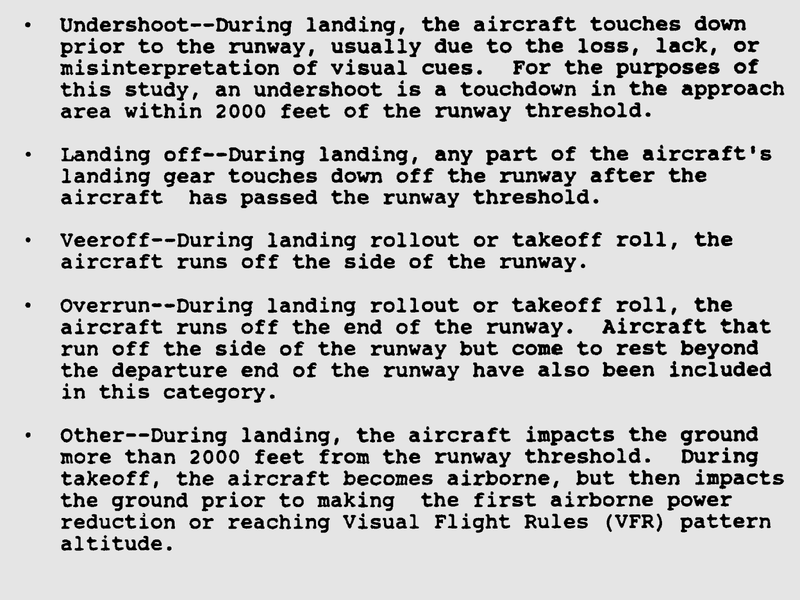 Very light touch of the runway surface with the landing gear and lack of compression of the left landing gear leg to the extent understood by the aircraft computer as the actual landing resulted in delayed deployment of spoilers and thrust reversers. Delay was about 9 seconds. 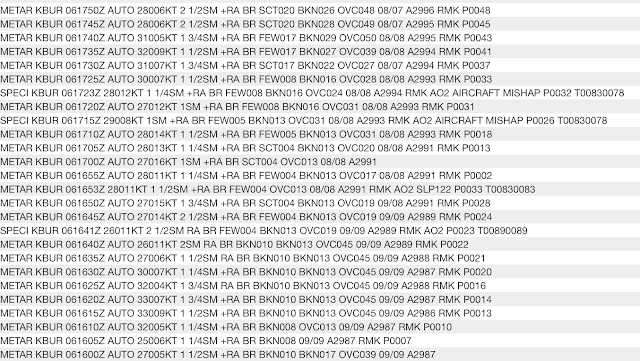 Thus the braking commenced with delay and in condition of heavy rain and strong tailwind (storm front passed through aerodrome area at that time) aircraft did not stop on runway. In effect of the crash one crew member and one of the passengers lost their lives. The aircraft sustained damage caused by fire. 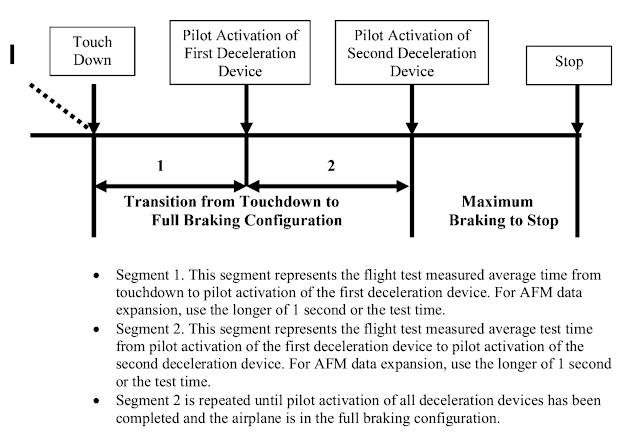 In the figure below, Braking Devices on Stopping Energy and Stopping Distance (refer to FSF ALAR Briefing Note 8.4), shows the relative effectiveness of each of the deceleration devices during the landing roll. The left most dashed line represents the minimum stopping distance. Autobrakes allow steady deceleration using two or three times the runway length to reduce brake wear. The tradoff of energy through braking, reverse-thrust, and aero-dynamic braking offers some insight into their relative benefits. For a minimum length roll, about 80% of the energy goes to the brakes, 15% drag, 5% reverse thrust. A medium autobrake landing using twice the runway length delivers 60% to the brakes, with drag taking about 20-25%, and reverse thrust up to 20%. Stopping with only 10% to the brakes and 40% to reverse thrust takes about seven times the minimum-roll. 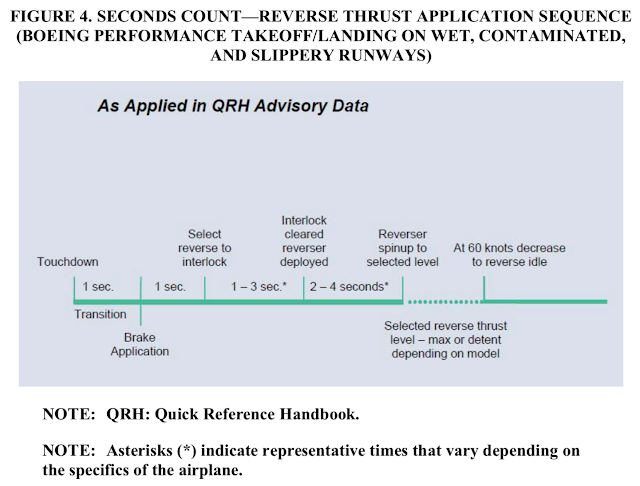 Engine reverse-thrust is the first action to start slowing down. Engine reverse-thrust is effective regardless of the underlying runway surface conditions. Slowing down the airplane with reverse thrust saves the brakes, reduces tire wear, and lowers tire temperatures. Reverse thrust and speedbrake drag are most effective during the high speed portion of the landing. Deploy the speedbrake lever and activate reverse thrust with as little time delay as possible. 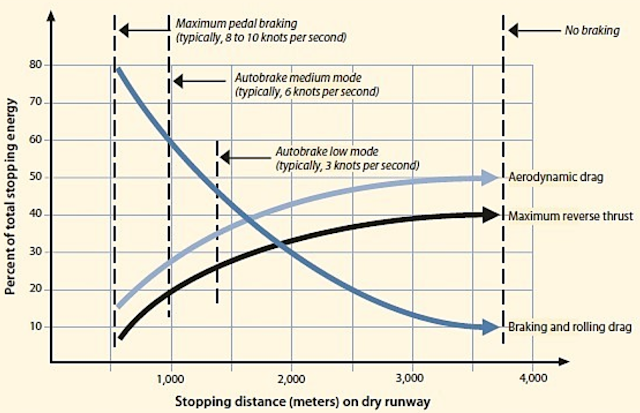 Braking effectiveness is mostly a function of the ability of the tire to grip the runway surface. The more weight on the tires, the more braking. The less slick the runway, the more braking. A coefficient of friction is used to describe runway surface conditions (type of material, dry, wet, icy). Autobrakes modulate the brakes to a target deceleration rate. Autobrakes are used to minimize braking to the available runway length. Manual braking is applied by either or both pilots through rudder pedal rotation. 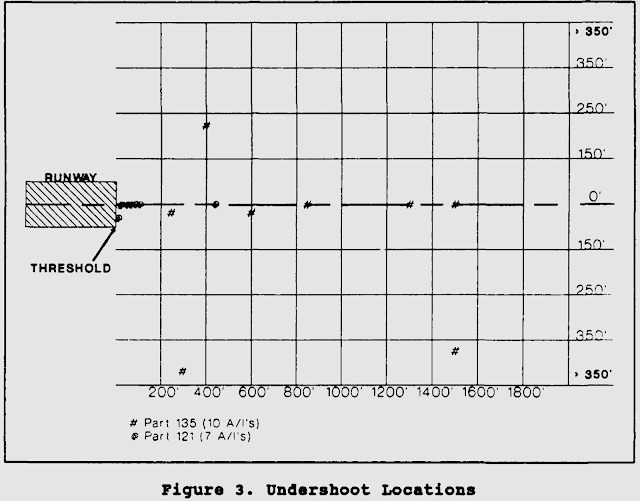 Manual braking is modulated by pedal pressure. The coefficient of friction depends on the tire condition and runway surface, (e.g. concrete, asphalt, dry, wet or icy). 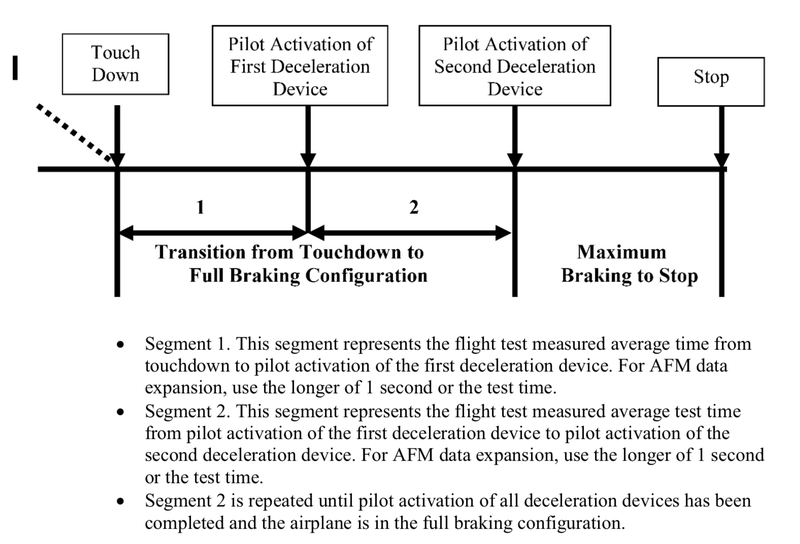 If stopping distance is not assured with autobrakes engaged, the PF should immediately apply manual braking sufficient to assure deceleration to a safe taxi speed within the remaining runway. 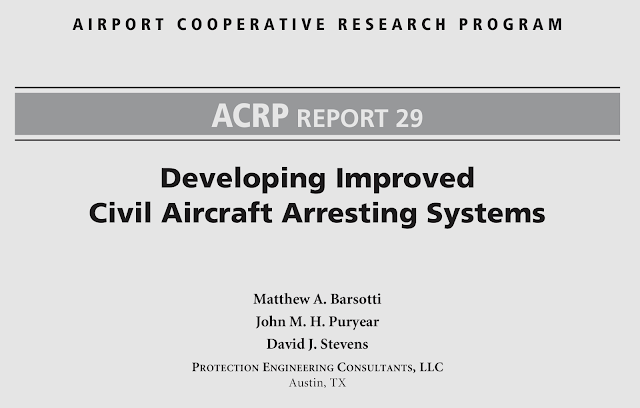 The performance level associated with good is representative of a wet runway. The performance level associated with poor is representative of a wet ice covered runway. Minimum stopping distance reflects an optimum landing, where every step is completed somewhat perfectly. Aviation always applies margins to account for natural variation. The goal is to avoid overruns, but to allow the greatest utilization, so there is a balancing act. As shown below, if the ideal stopping distance were to be "1", then a 2/3 margin is applied for "required" runway length. While you could stop the plane in 6,000 feet, the regulation requires a minimum runway length of 10,000 feet. If the runway is wet, a minimum of runway length of 11,520 feet is required. The UK CAA requires the wet runway length in all cases. A wet runway can be optimized by grooves to avoid puddles. Puddles can lead to hydroplaning. The Flight Safety guidance notes that standing water can lead to doubling the landing distance. Noting that the wet runway guidance applies only a 92% margin, Standing water will likely lead to an overrun if the runway length is minimal. The following landing distance factors are typical:• Wet runway: 1.3 to 1.4;• Standing-water or slush-contaminated runway: 2.0 to 2.3;• Compacted-snow-covered runway: 1.6 to 1.7; and,• Icy runway: 3.5 to 4.5. Ideally, the wind is aligned steadily down the runway in the face of the pilot. This is considered a headwind. Ground speed is the combination of true airspeed and wind. A headwind reduces ground speed. A tail wind (the opposite direction as a headwind, coming from behind the pilot arriving at the runway) will increase ground speed. Ground speed relates to kinetic energy, or the square of the ground velocity. 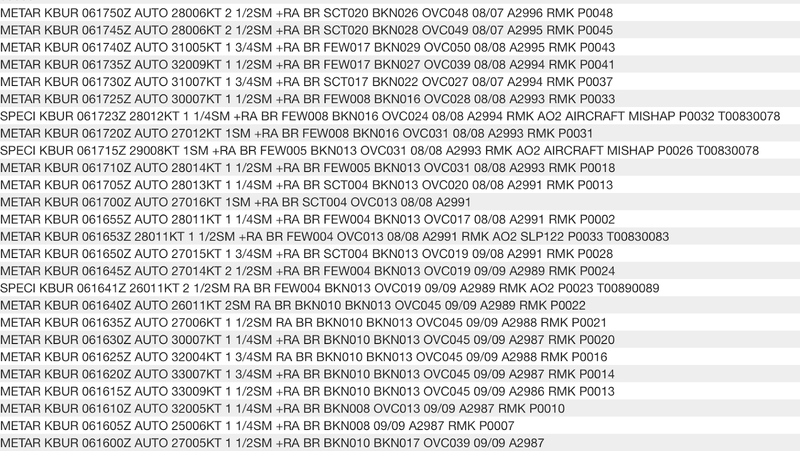 A 10 knot headwind becoming a 10 knot tailwind for an airplane with 140 kTAS means the headwind is going 130 knots and the tailwind is going 150 knots. 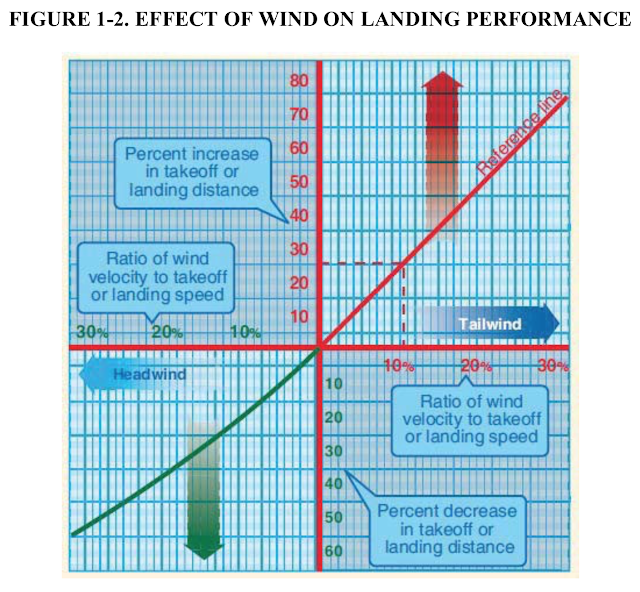 The airplane landing with a 10 knot tailwind has over 30% more energy to dissipate than the airplane landing with a headwind, which is proportional to the increase in stopping distance. 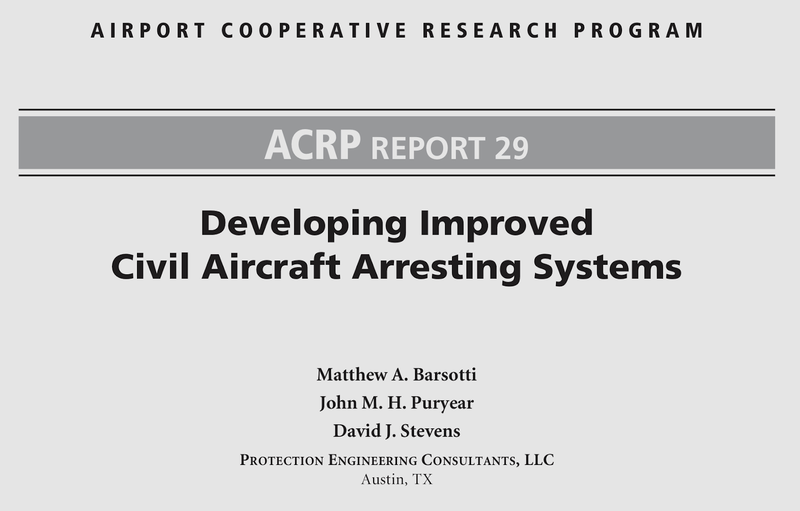 Approaches are usually designed around a Vref, a reference speed relative to a given flap setting and landing weight that is something like 23% faster than the 1g stall speed. The approach is usually flown 5 knots or more above Vref. During the flare, the airplane should slow down to touchdown at about Vref (nowhere near stall speed!). If carrying extra airspeed, that translates like a wind component, to ground speed. Noting that 1.1 squared is equal to 1.21, or 21% greater. A graphical representation is shown below. 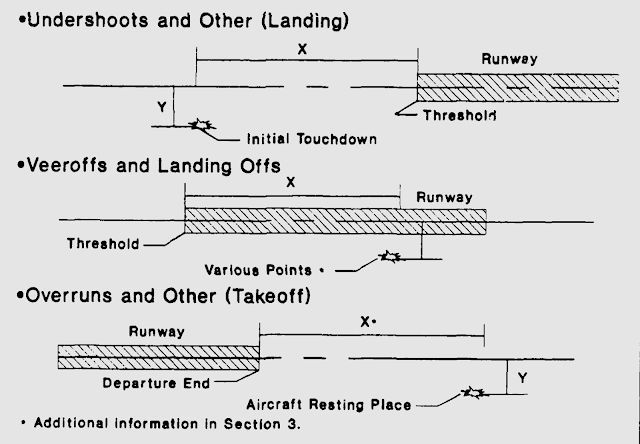 Ideally, runways are perfectly level. However, miles of purely flat terrain are difficult to find. While runways have may have local dips, more importantly is whether the runway is generally uphill or downhill. Slope or Gradient describes the pitch of the runway, expressed in percent (height/length). 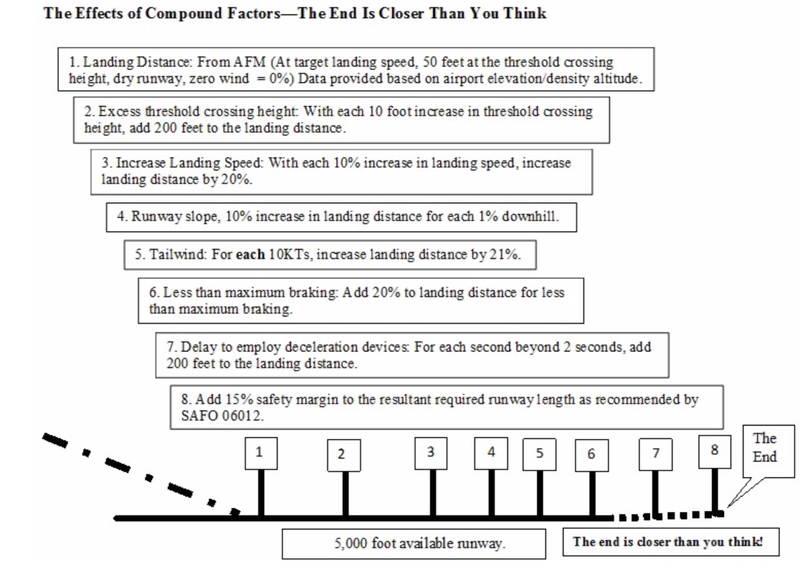 A 1 percent downhill slope increases landing distance by 10 percent (factor of 1.1). Each landing factor is compounded by every other factor. A tailwind and a wet runway have an additive effect. About 90% additional stopping distance is required if the spoilers are manually applied and anti-skid braking is inoperative. 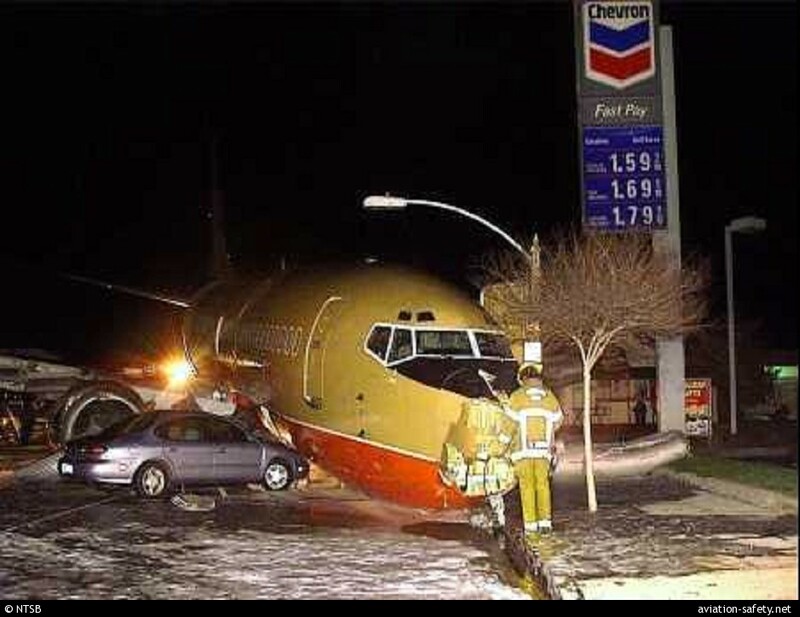 On March 5, 2000, a Southwest 737-300 was unable to stop when landing at BUR Runway 8, exiting the airport property to end up near a gas station. Runway 08 is 5,802 feet long with about 0.5% down-slope. The NTSB accident investigation reported that the unstable approach was flown too steeply, arriving with excessive airspeed, onto a wet runway, with a slight tailwind. 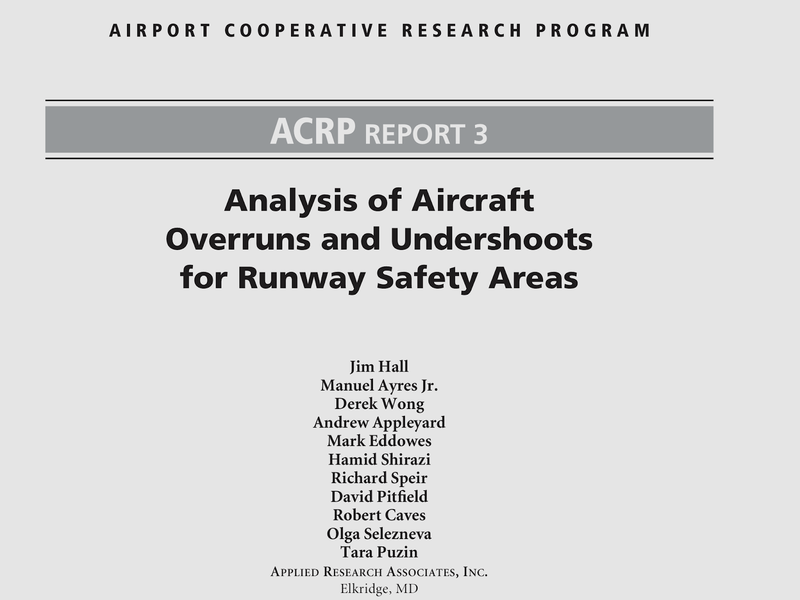 BUR has two grooved asphalt runways, 8/26 and 15/33. BUR ATC tower personnel indicated to investigators that runway 8, which is used ìmost of the time for landings, is the only arrival runway that avoids high terrain. Runway 26 is used infrequently by air carriers for landing because of terrain to the south and east of the airport. 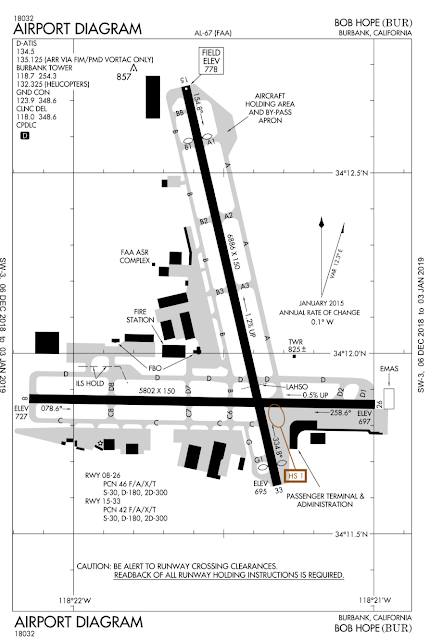 Runway 33 is used for landings when the tailwind component for runway 8 exceeds 10 knots and wind is from the northwest. 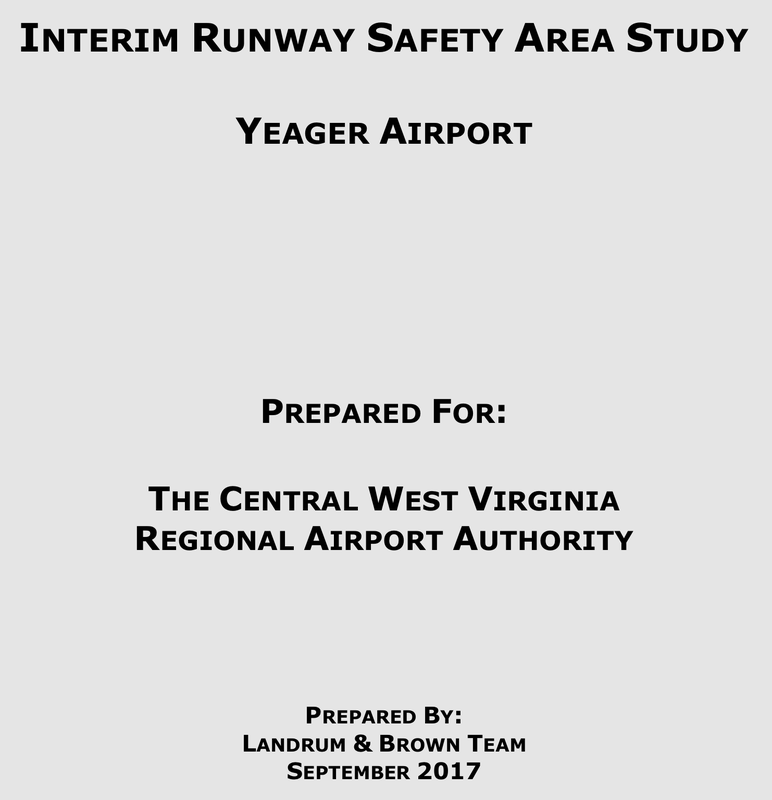 They also indicated that no instrument approach is available for runway 33, and rising terrain is located under the left base segment of the traffic pattern to this runway. For runway 15, aircraft must be established on final approach for landing before descending out of 3,000 feet. 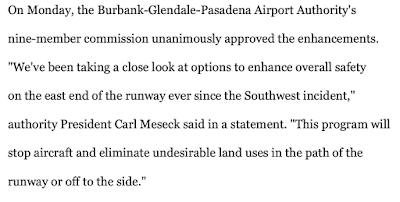 They indicated that the San Gabriel Mountains are located north of runway 15 and that hang glider activity sometimes exists in the area of the final approach to runway 15. Follow the following link to read all about EMAS. 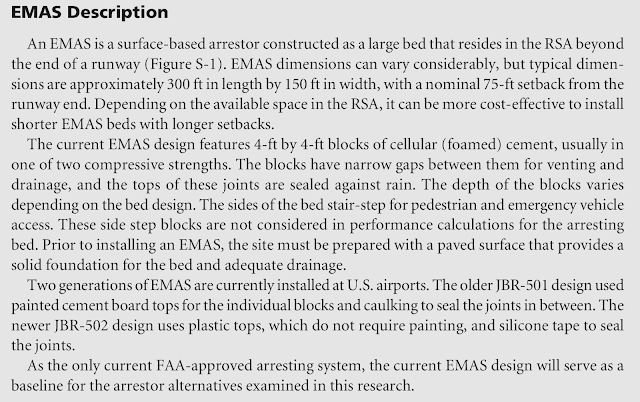 EMAS provides braking passively to an aircraft through clever materials that crumble upon intrusion. A runway safety area (RSA) surrounds a runway in case an airplane undershoots, veers off, or overruns. 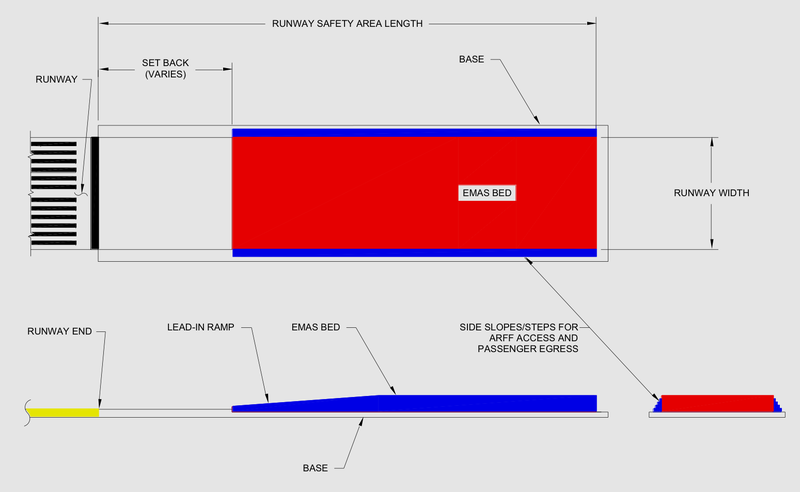 EMAS fulfills a Runway Safety Area requirement. After the Southwest overrun in 2000, Burbank installed EMAS, as mentioned in the accident report. 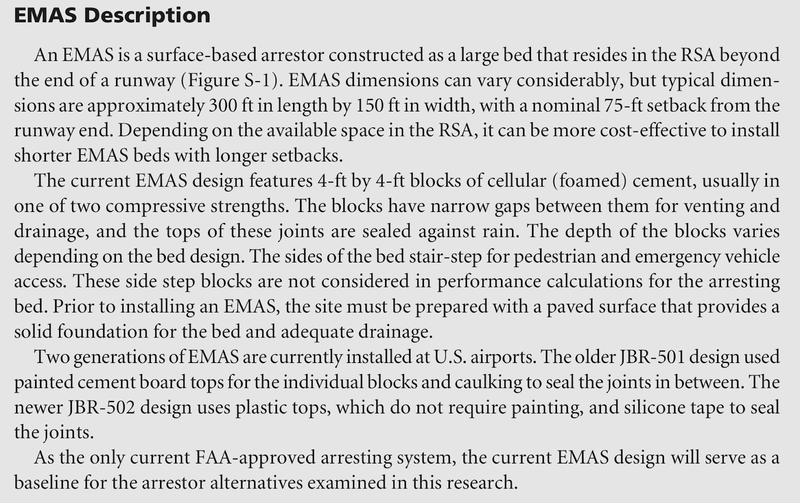 EMAS has already been involved in 13 arrestments, with one of them already at BUR. 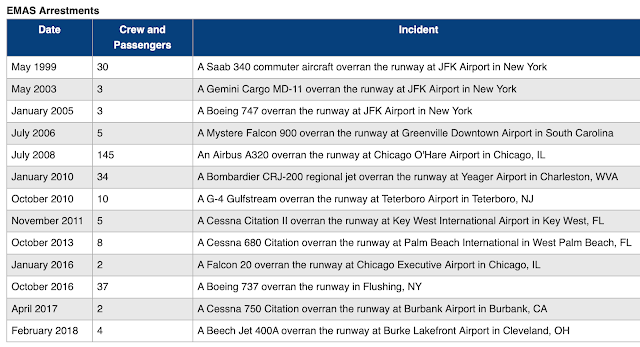 The 14th arrestments occured on Dec 6, 2018, when another Southwest jet, a 737-700, overran Runway 08 again! The EMAS worked well, with no significant injury reported. That makes two saves for the same runway. The following is made with reference to a copy of a 737-700 manual and may not be accurate. The trends are relevant. 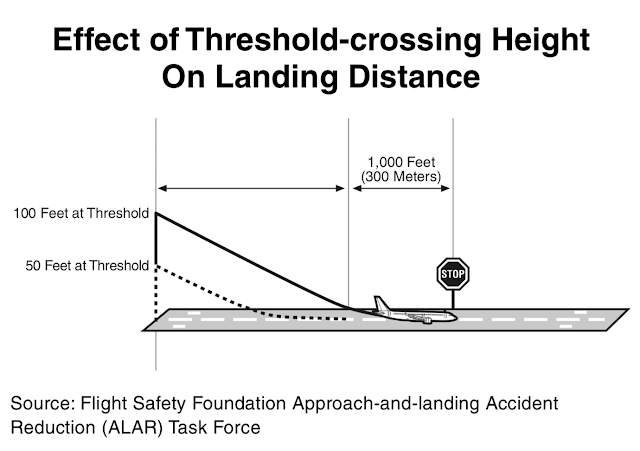 A 5802 foot runway can support about a landing weight of about 160,000 lbs if dry and no wind. 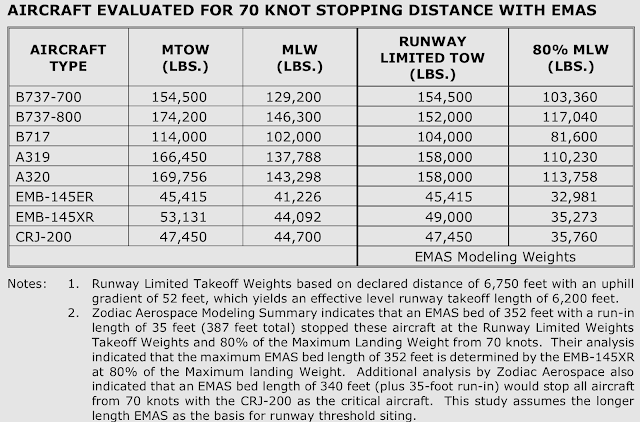 A 10 knot tailwind reduces the allowable landing weight to about 130,000 lbs (if dry). A wet runway can support with a 10 knot tailwind reduces the allowable landing weight to 115,000 lbs. 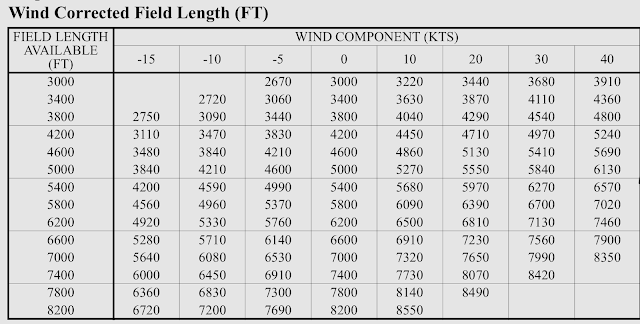 A 10 knot tailwind (-10) reduces runway 08 from 5802 feet to 4960 feet. A 4960 foot runway (~5000) at 1000 feet can support a landing weight of 130.1 klbs if the runway is dry. A 4960 foot runway at 1000 feet can support 108 klbs if the runway is wet. 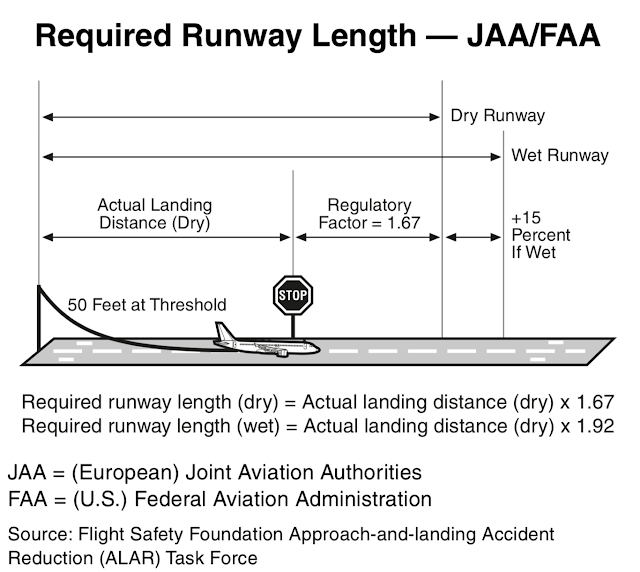 The wet runway allowable landing weight provides 92% margin for stopping distance compared to a dry, perfect landing. The wet runway allowable landing weight accounts for the tailwind and wet surface factors. 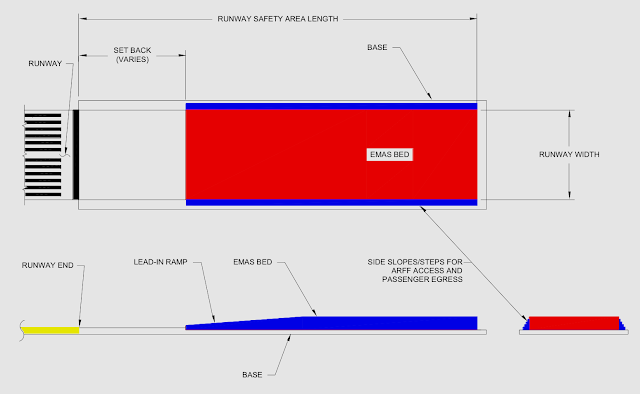 If anti-skid is inoperative, and if spoilers are deployed manually, and if wet with a 10 knot tailwind, the allowable landing weight is below minimum (not possible). A downslope of 0.5% adds about 5% to the stopping distance. Any standing water could more than double the stopping distance. If landing at the allowable gross weight, assuming wet and 10 knot tailwind, would allow for stopping distance to increase by 92%. If the standing water adds more than 100%, an overrun is certain. 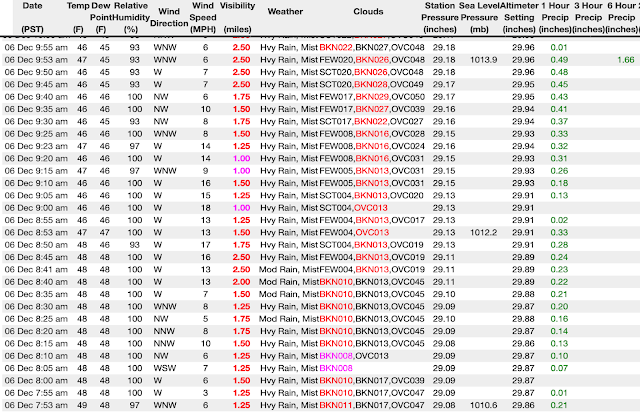 The winds were from the West (270-280) at 15-18 mph (or 13-15 knots). This would be at least a 10 knot tailwind to an airplane landing runway 08. Extremely heavy rain had fallen morning prior to and during the accident, with about 1/3 of an inch within 60 minutes of the accident. The rainfall was very heavy during the accident, at a rate of about 1 in/hr (about 0.1 inch fell in the 10 minutes prior to the accident). Nearly 1/3 of an inch fell in the 20 minutes just before and after the accident. The runway may have standing water, even with grooving. Visibility dropped to about 1 sm, with ceiling at 1300 feet AGL. The visibility makes the approach IFR, allowing a view of the end of the runway after crossing the runway threshold. The 737 rolled into the EMAS by about 110 feet. 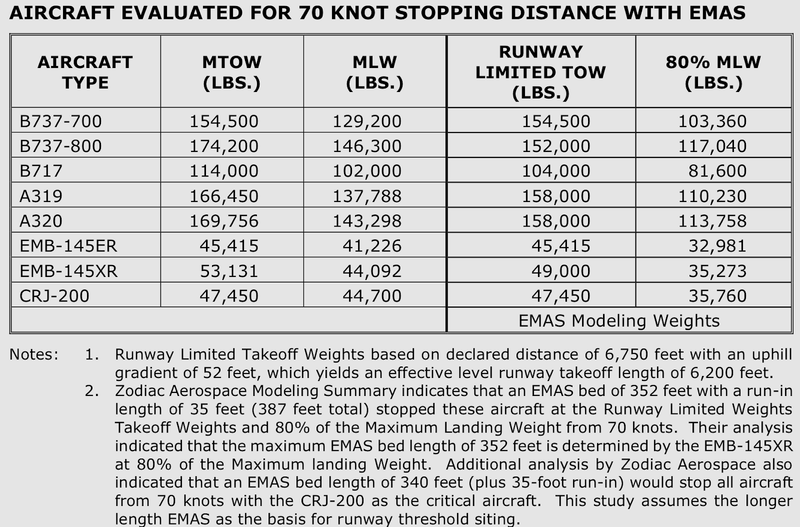 Based on rudimentary analysis, the 10 knot tailwind to a wet runway would have limited the allowable gross weight to about 115,000 lbs. Any landing near that weight that also encountered standing water would be likely to overrun. Any landing above that weight would also likely overrun. Other factors related to height over threshold, speed at touchdown, touchdown point, and deceleration rates; are not known. 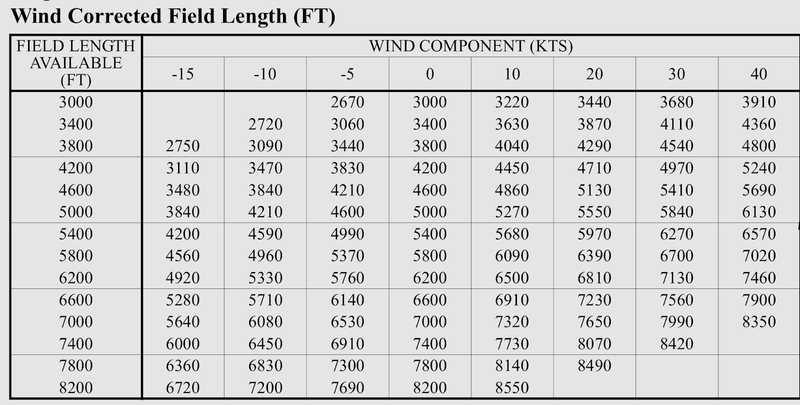 The allowable gross weight accounts for tailwind and for wet runway condition. The tailwind component had been steady for more than 20 minutes preceding the accident. Heavy rain had been falling in the same time, building a chance for standing water. 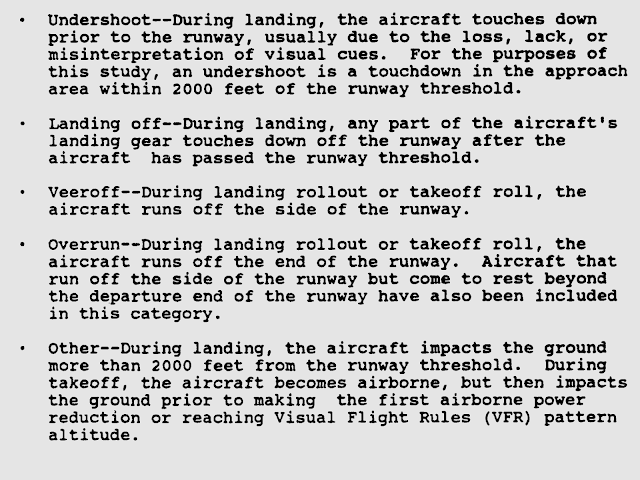 If approach and landing was flown reasonably well, and within allowable gross weight, then standing water would be most likely to have caused the overrun. If approach and landing was not flown reasonably well, then that would be the most likely to have caused the overrun. 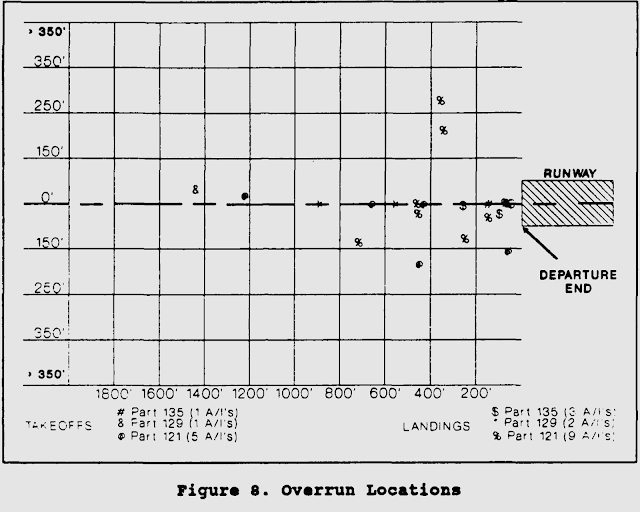 If landing was accomplished above the allowable gross weight, for example by failing to account for the tailwind, than that would be most likely to have caused the overrun. The flightradar24 playback track does not align in any way with the approach and landing. There is no useful analysis that can be made. There are low altitude ADS-B receiver dead zones near BUR which may have hidden some additional maneuvering. There is no benefit to comment on the track until it can be confirmed. The last reported position was at 9:04am local, 600 feet altitude southeast of the airport traveling east at 151 knots ground speed. 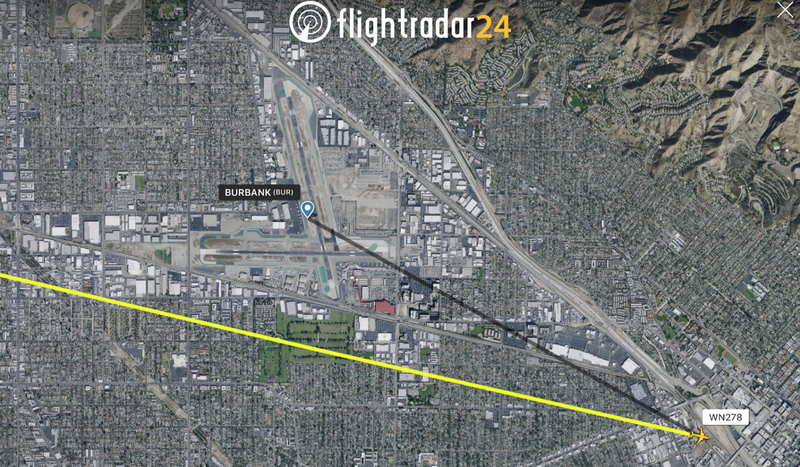 BUR is around 700 feet MSL, which puts the airplane on the ground. This was not the case. I received an ADS-B track directly from flightradar24.org. The issue with the display was that instead of showing the ADS-B positions, we displayed FAA provided positions (which are often less-than-accurate at lower altitudes). Our development team is now looking into why the system displayed the FAA positions instead of the received ADS-B positions. Vertical approach profile looked normal. Lateral approach profile showed correction from right to left just prior to landing. Airplane was traveling 49 knots at the runway end. There is no data to judge why the airplane did not decelerate. The touchdown point and midfield speeds are not recorded. Alaska AS522 arrived at BUR about 12 hours earlier. The approach and landing on runway 08 was uneventful. Using AS522 in white, and WN278 in red; the two approaches can be compared side-by-side. AS522 lateral approach appears markedly stable, while WN278 seems to meander a bit, with a correction right to left just on short final. The vertical profiles look normal for both. The right to left correction on short final may have contributed to exiting the runway on the left side. EMAS is designed to stop airplanes up to 70 knots. 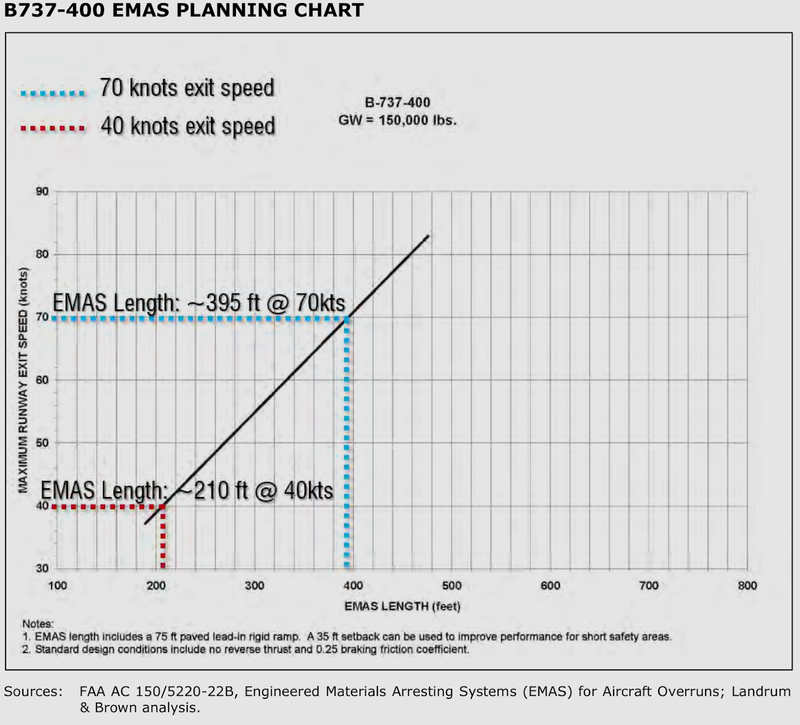 A Boeing 737-400 overrun into EMAS shows the extent necessary to stop a plan. EMAS Planning Chart for 737-400 at 150,000 lbs. An approximate 110 foot excursion into the EMAS occurred. 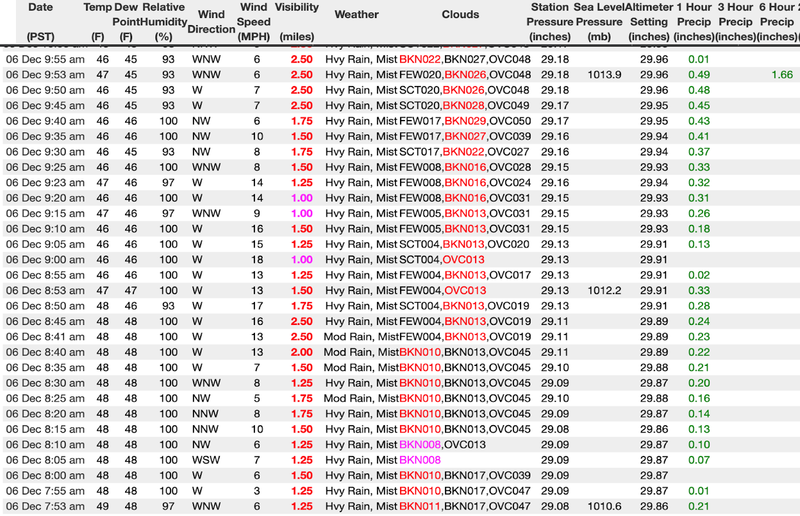 The last recorded speed was 49 knots, about 220 feet from the EMAS. 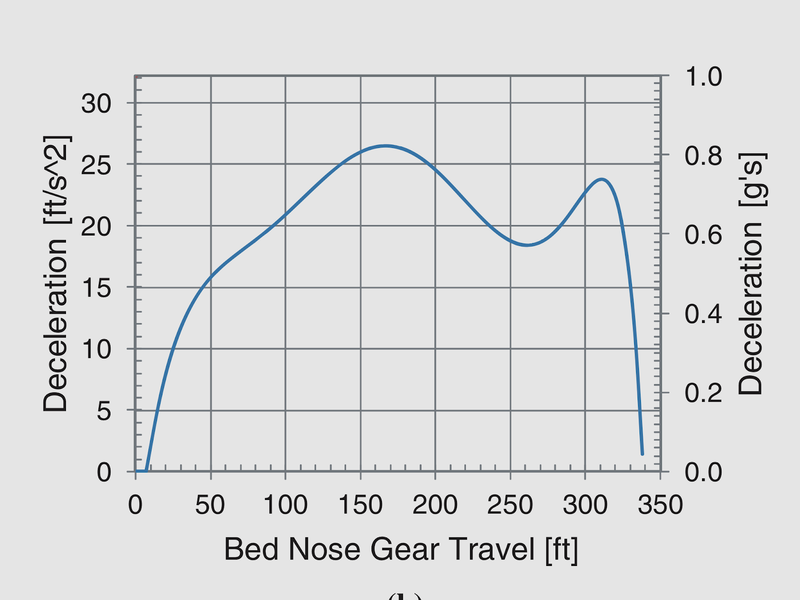 The nose gear bed travel graph shows that a 737 airplane at 25-30 knots would travel about 110 feet. The suggests the entry was less than 30 knots. The EMAS may have performed better than shown. 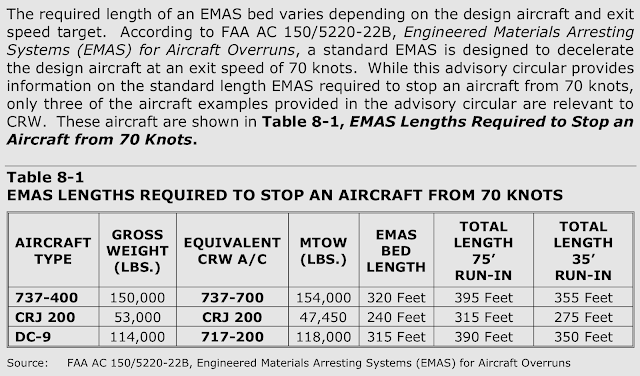 The variable is how many knots were lost from the 49 knot position to entering the EMAS. 15 knots seems about the most to hope for. That suggests maybe the entry was about 35 knots or greater. Since the speed measurement is relevant, the graph exemplary, the entry speed of 35 - 40 knots seems most likely. Peter Lemme has been a leader in avionics engineering for 37 years. He offers independent consulting services largely focused on avionics and L, Ku, and Ka band satellite communications to aircraft. Peter chaired the SAE-ITC AEEC Ku/Ka-band satcom subcommittee for more than ten years, developing ARINC 791 and 792 characteristics, and continues as a member. He contributes to the Network Infrastructure and Interfaces (NIS) subcommittee developing Project Paper 848, standard for Media Independent Secure Offboard Network. Peter was Boeing avionics supervisor for 767 and 747-400 data link recording, data link reporting, and satellite communications. He was an FAA designated engineering representative (DER) for ACARS, satellite communications, DFDAU, DFDR, ACMS and printers. Peter was lead engineer for Thrust Management System (757, 767, 747-400), also supervisor for satellite communications for 777, and was manager of terminal-area projects (GLS, MLS, enhanced vision). An instrument-rated private pilot, single engine land and sea, Peter has enjoyed perspectives from both operating and designing airplanes. Hundreds of hours of flight test analysis and thousands of hours in simulators have given him an appreciation for the many aspects that drive aviation; whether tandem complexity, policy, human, or technical; and the difficulties and challenges to achieving success.